Region 9 Developmental Services Program provides comprehensive developmental/early intervention activities that benefit the families and children from birth through age three who have or may be at risk for developmental delays. All services are designed to educate, support, and strengthen the child's primary caregiver in the decision-making process regarding the developmental intervention services. Staff members work with families to identify the outcome desired for the child and explore the strategies to achieve that outcome. Early interventions result in enhanced physical motor, communication, adaptive behavior, cognitive, and social-emotional development in the child's targeted areas of need. Some options of this program include family counseling and education; health services; Child Find and screening services; assessment and evaluation services; special instruction provided by developmental specialists; nutritional consultation; occupational, physical, speech, and language therapy; transportation; family service coordination; and respite care services. An Individual Family Service Plan (IFSP) is developed for each child/family based upon determined needs. As children and family needs can change frequently, flexibility and adaptability are an integral part of this program. Developmental Services was a recipient of a three-year Accreditation with Distinction from the Accreditation Council during four accreditation cycles. Many children are born with or may develop conditions that could impair their normal growth and development. Child Find is a nationally recognized model of an ongoing community effort focused on locating, identifying, and evaluating children with special needs from birth through 21 years of age. Parents of children with difficulties in one or more of the areas of vision, hearing, speech, language, movement, thinking, learning, or self-help skills are encouraged to contact the Region 9 Child Find office. A free developmental screening is available in any of these developmental areas, and children are not required to be of school age to qualify for these services. Children may be referred by anyone, including teachers, child-care providers, physicians, friends, or family members. For a child to be screened by licensed personnel, written permission from a parent or guardian is required. If the screening process indicates a possible delay, the child will be referred for a comprehensive evaluation that includes intellectual, motor, and speech and language assessments as well as medical status. A team of therapists, instructors, and the parents will design a program specifically to meet the child's needs. With early testing and positive intervention strategies, many developmental delays can be completely corrected. Region 9 Child Find coordinates Child Find activities with public and private schools, child-care facilities, Head Start, public health services, Region 9 Early Intervention Services, Zia Therapy Center, and Parents as Teachers. The Transition Services of Region 9 refers to the period during which the children participating in the Developmental Services Program and their families receive services that enable them to change smoothly to another program when the child's needs change, the child reaches the age of three years, or the family moves from the area. Transition services are offered if the child is eligible for "Part B" services (services for school-aged children with disabilities) under IDEA (Individuals with Disabilities Education Act) or for other services. In compliance with federal regulations, at least 12 months before the child's third birthday, the IFSP shall include the steps to be taken to support the transition from Developmental Services Program to other appropriate services. With parental consent, written referral shall be made to the appropriate school district to determine a need for special education and related services. If the parent does not want a referral, other options will be discussed with the parent. The Developmental Services Program has interagency agreements with the member school districts, community child-care centers, private child-care centers, and home-based child-care providers to provide a smooth transition for children and their families. Through several interagency agreements, the Developmental Services Program maintains excellent professional relationships with Children's Medical Services, Home Visiting/Parents as Teachers program, Head Start and Early Head Start, Lincoln County Medical Center, WIC Program, Early Childhood Evaluation Program-UNM Hospital, Public Schools 3Y4Y Program Staff, Home Health of Lincoln County, child-care providers, and other community providers. 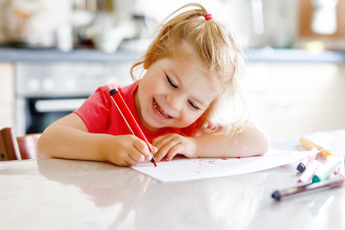 Many of the services for children under the age of three and their families are provided in an inclusive setting with Home Visiting/PAT Group Connections. Such examples of collaboration include parenting classes and playgroups. Funding sources for the Region 9 Developmental Services Program is provided by the New Mexico Department of Health and New Mexico Medicaid Program.